Sketch comedy is some of the hardest form of comedy to write and be funny. When you have a character that works and is loved, you might as well bring her back every opportunity you can. Molly "Equality" Dykeman makes a triumphant return in the hilarious new comedy A Microwaved Burrito Filled With E. coli. 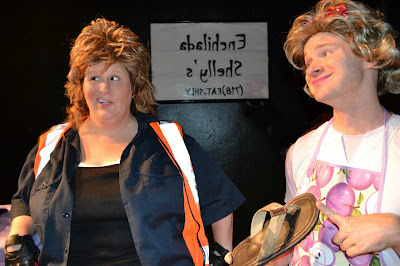 Written and performed by Andrea Alton and Allen Warnock, Molly visits Enchilada Shelly's for a wedding and ends up making a connection with waitress Angie Louise Angelone. Through foul-mouthed humor and poignant dialogue, a friendship is formed in beautiful fashion. What makes this play special is the writing. It starts off crazy but there is immense heart built right in. And it flows out naturally. Molly and Angie are endearing characters with a whole lot of depth. But it's Alton and Warnock’s remarkable ability to infuse important talking points seamlessly into a comedy that resonates. Molly just wants lasting love. Angie wants to find acceptance. And a best friend. These characters may appear big but their desires are pure. Being able to balance the two in the writing is a mark of comedic genius. What’s undeniable is the immeasurable chemistry between Alton and Warnock. Even when something went off script, there was never a beat missed. Director Mark Finley helped the duo best navigate the small stage of the Huron Club. Even with the limitations of the space, a little restaurant was created. Finley focused on Molly and Angie’s story while allowing the writers-performers to have room to have fun. A Microwaved Burrito Filled With E. coli is shameless fun that will make you smile. This is a great play to bring your best friend to as a reminder the beauty of friendship.